Considering purchasing the American DJ Airstream Bridge DMX? Have questions? Ask people who've recently bought one. 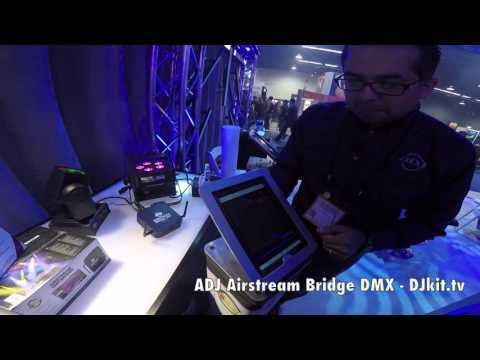 Do you own the American DJ Airstream Bridge DMX? Why not write a review based on your experience with it. This is an intuitive controller for DMX products. You do not require any knowledge of DMX but if you need to create your own profiles it does help. For programming, it takes a little while to understand the "Latest Takes Precedence" protocol that it uses which means that sometimes you need to reset the units to avoid over programming but it only takes a couple hours to master it. The ability to move around a venue and access your lighting from any angle can save hours in programming and cable running as well. The only downside is that it comes with a US plug with UK adaptor and its not that long. All in all though a great product which most users will master quickly. The ADJ Airstream Bridge DMX is a fantastic piece of kit if you want to operate from an ipad. I use this all the time and use an ipad mini which works great for me. Very clever piece of kit. Overall, I am happy with this product. However, the only downside is the lights become less responsive (time delay when switching to a different light show for example) to the app if you are using the airstream in a wifi-congested area i.e. a hotel. I'm fairly new to the dmx line and i found this the best option for me to program some simple up-lighting colour chases and scenes for my pocket spots. The more and more i use this the more features i find. I’ve previously used this item at a club and fell in love with simplicity of the device! So I eventually brought my own! Hands down the best way to DMX! Does everything we need and more. Nice, clean easy system with no 'coding' needed! I've owned one of these Airstream Bridges for over a year now and initially, I struggled to get on with it. I totally get DMX but the app just didn't seem to suit my style of DMX programming. I also like to mix things up on the fly and as much as I tried, I just couldn't get on with the app. Therefore the Airstream Bridge started to gather dust in my collection of unused DJ gear, until... ..along came Light Rider. This is a fabulous intuitive app that works brilliantly with moving heads and par cans and furthermore it can connect to any ART-NET device. The Airstream Bridge fully supports ART-NET so I gave it a whirl. It's fabulous! This is the perfect combination for me. Light Rider is currently free for iOS and Android tablets and I would willingly pay for it anyway. My Airstream Bridge now has a new lease of life and I get to control my moving heads and pars from my iPad with just the level of on-the-fly tinkering I like, to keep my light shows fresh and relevant for the genre I'm playing. Love this combo so the Airstream Bridge now gets a 100% recommendation from me. It either does not work with most lights or is total rubbish as yet to get it to work and their help line is also not good at being helpful. Save your money. 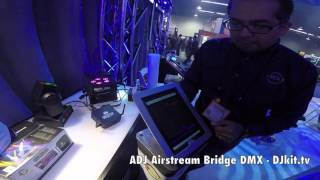 Seen a video for American DJ Airstream Bridge DMX online or have you own video? Check out American DJ Airstream Bridge DMX on DJkit.com!